You are currently browsing the tag archive for the ‘seeing’ tag. The process log is a means for telling the story of your learning in words and pictures. Like any good story-telling technique, a great process log embraces all the ways a concept might connect the maker to the “reader” and takes full advantage of what words can provide. You might create a provocative headline “This is how you stop time”; or a compelling topical sentence “ignoring where our waste is going and chastising those who help in that process is a way for people to deny their responsibility“; or exciting content “the first known valentine message was sent by a prisoner of war in 1415”; or humor on occasion: “I never knew that a chair could be so hard on a lady.”. Language is a tool. Well-crafted writing helps me disappear into the specific flavor of another person’s story. Imagery, like words, has its own language. When a maker uses the distinctive properties of visual messaging, she makes her story stronger. A photograph created from an unusual point of view, or in the dramatic lighting of a particular time or day, or depicting unexpected subject matter, can lend details to a story that words can’t capture. A picture strategically placed may indeed be worth a thousand words. Images can perform what text cannot. Words can reveal what images cannot. In a blog, both languages well-crafted and working in tandem can create a compelling transporting experience. The right relationship of word and image comprise the main content and message of the blog, but the presentation of the work is an essential component for consideration. What is the overall format of the work? (In WordPress this option can be explored in the menu under “appearance”, but these principles apply to any visual framing device.) How one critically applies her knowledge of the elements and principles of design in order to best present her idea is a critical factor in creating engaging visual impact. A good rule of thumb in making format choices is to never choose a framework that detracts visually from the content. Formats aren’t yet standardized for digital media, so an artist can (and must) rely on her own critical eye to make good design choices. This compares to a general “standard” for turning in essays that are typed, double spaced, contain a 1.5” edge margin, and 12 point type; or to the white walls of a gallery with all picture frames on center at 60 inches from the floor. In the absence of an accepted standard format for digital presentation, the maker must ensure a strong “frame” that highlights, rather than competes with, the work. A successful example of good framing is in textovernebula’s blog, where the quality and variety of the images are “read” immediately because of the careful choice of a design style. The template they chose (Theme: Imbalance 2 by WPShower) features a simple meticulously structured format that focuses on the strength of the images and headlines in the blog and avoids disruptive decorative clutter. It is as if the page were a museum with walls that embrace the carefully curated work and invite us in to view them. I expect to be served tea. The white area surrounding the columns of body text suggests an abundance of space, fresh air, and time. The images shine through like intricately wrought chocolates in a delicately packaged text box of goodness. I want to select and savor them, one at a time. I am welcome here! Delightfully, when I click into the specific stories I am not disappointed. The photographs are nourishing, and the writing is strong in craft and interesting in content. Their blog connects me to a deeply considered and personal point of view. Exciting visual connections and engaging, thought-provoking work that elicits an authentic experience is also found in the blog of baker160. A typical response from a student to an assignment that asks you to describe a class project sounds like a very dull subject to report on. So it is a double the thrill to read a work that expands the experience into an expanding complex of interwoven details. This process log is filled with delicacy and rigor and includes references ranging from the universal to the commonplace in an exciting subtle and smart interplay of personal narrative. It is a joy to read. It’s sort of a Renaissance blog, linking big (human) and small (personal) ideas with social and political content that is current and relevant. baker160 uses the power of the web to link thinking with evidence through her wide-ranging linked references that include mathematical formulas, the first recorded valentine, videos of gulf shrimp deformities and a shaky guitar player singing an acoustic valentine. Sample excerpts below give you a flavor for the blog, but I recommend reading–and subscribing to–it! 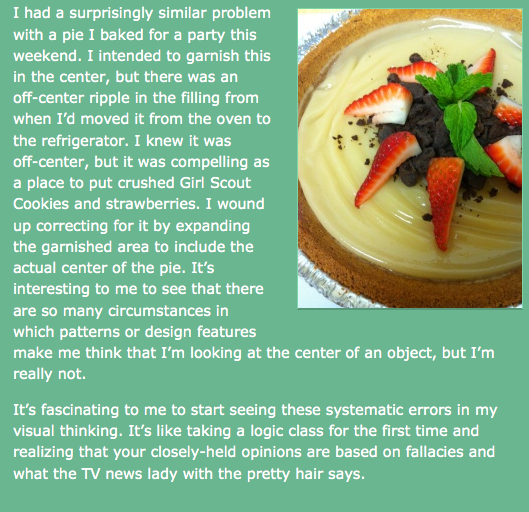 “I had a surprisingly similar problem with a pie I baked for a party this weekend. I intended to garnish this in the center, but there was an off-center ripple in the filling from when I’d moved it from the oven to the refrigerator. I knew it was off-center, but it was compelling as a place to put crushed Girl Scout Cookies and strawberries. I wound up correcting for it by expanding the garnished area to include the actual center of the pie. It’s interesting to me to see that there are so many circumstances in which patterns or design features make me think that I’m looking at the center of an object, but I’m really not. Attention to the craft of visual and written language makes the structure disappear, and lets me revel in the experience of ideas. The maker reveals who she is in her manor of writing and showing, and if she’s honest about that, I am interested and engaged. When you share experience and it feels true to me, you leave me asking questions about my world and I can see how your truths apply to me. Your experience increases my own. 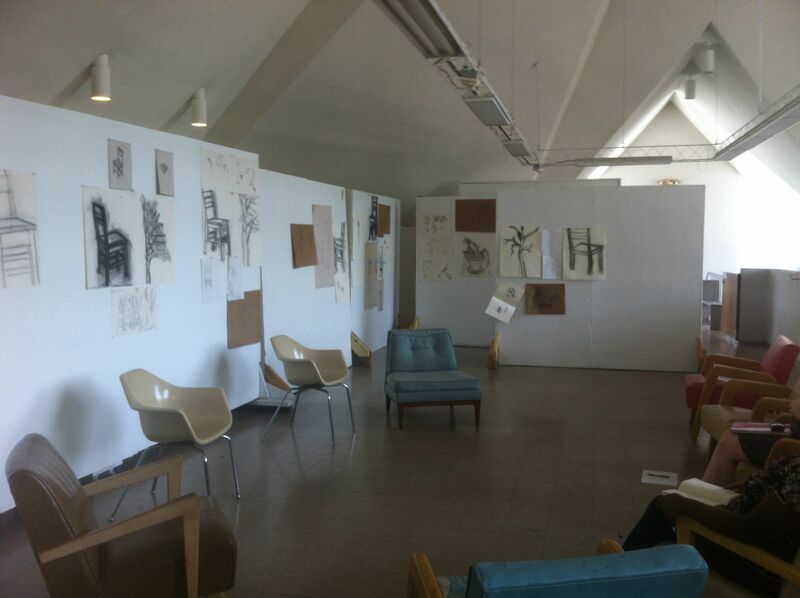 I’m not going to lie, I love looking at drawings I have been lucky enough to witness in the making. There’s an undeniable accomplishment up on the wall that is simply waiting for affirmation—like the makers and I both see the effort represented in these pictures, and it simply awaits a benediction. I guess that’s how I see critique these days–as the explicit sanctioning and recognition of the practice of creative process. The sincerity of the marks in this situation seem to never be “wrong”. Each picture has its own humble offering, and in critique we can make it real—like in the story of The Velveteen Rabbit…each artist comes in with a well-loved, worn and threadbare stuffed animal that wishes it could hop, and as we acknowledge each drawing its little heart starts to beat, and ultimately it skips off into the woods into its life as a real live bunny, with the magic generative ability to BE (hopefully it reproduces like a rabbit). Through the act of sitting together looking at the drawings we find distinctions and mutual understandings that make the drawings come to life. This discussion is an essential ingredient to the studio community—an ability to make meaning of the process through looking at a map of the work. Ironically, the end product (the map) always carries value. Even though I ask the artist to completely forget the end product, to make a mess of the page, to simply concentrate on getting the lines right—there is always a fascinating vitality to the page. Likely the interest of the image is because of the artist’s attention to making an authentic accurate line, and liberating herself from the burden of a perfect end-product. Little real moments are always more interesting than perfection to me, and add endless life to the line itself and to the classroom. One of the most difficult tasks of the artist is to put her work on the wall, weather it’s pinned to the clumsy cobbled together ten-year-old wall of a working classroom studio space, or framed on the wall of The Museum of Modern Art, to SHOW our work is to show ourselves undefended. Super scary! And yet, it is the work of the artist to do so, indeed it is why we work: some inner drive to seek, to show and to make ourselves known. The task then, is to show our work and receive its critique without getting hit with the information as if it were some bullet into our soul, but rather receiving the words to increase the meaning and efficacy of the work itself. When we can remove ourselves from the work, and see the imagery as separate from us, we gain a great deal from the insights of others. It is in our capacity to gain understanding that the horizons of the whole venture expand. In my view it is essential that the wall we pin our work to, and the people who surround the work be trustworthy, valued and valuable. We need to know that they will be direct and honest and speak in the best interest of the work. Of course we can’t always be sure that this will be the case, and can only build trust through the experience of risk—in sticking our necks out we become strong. In trying, we grow. I am grateful when the circle of influence generated by the effort of a class works this way. The environment of a critique may be influenced by me, but it is realized through the honest effort of the community of the class. I am exhilarated to walk into a room and see the risk on the walls, and the attentive engaged energy of the artists in the room. In the critique space we realize our effort at building a relationship with each other, with language and with our work. I am heartened to see that strong sense of trust reflected in the words of my students. The quotes in this passage are linked directly to the students own writing. Critique provides space to reflect on the drawing experience, to see what you learned and in many ways to detach from the work so you can “hear” it. Then it clicked with me: this isn’t an exercise about drawing, it’s about seeing. The lines on the paper only tell the story of what you saw, kind of like a lab notebook in squiggle form. The drawing is not supposed to be photo realistic. What matters is that I connected my eyes to my arm and recorded the lines I perceived in the hand. I really hated it! 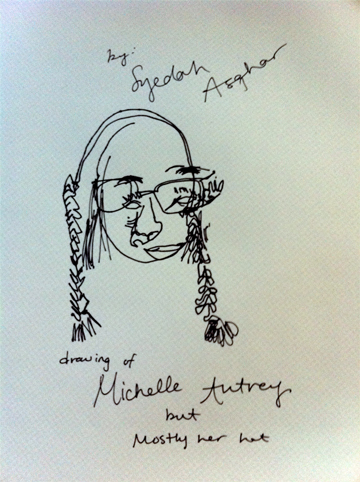 I felt so out of control….One thing I found interesting was that I was less frustrated when I was drawing blind contour with my left hand. I think this was because since i am right-handed, I felt better about drawing “badly”. It was like because I was drawing with my left hand, I was given permission to draw badly and be out of control. This class in particular was relaxing and a real pleasure to participate in….the further on in class we got the more comfortable I was with letting go and letting whatever happened happen. When I looked at what I had done I was always surprised. What I drew and what I saw in my head were completely different. there’s so much you can’t see in an object (or a face!) at first, second, or even third glance, but being forced to look at the same lines over and over really makes it impossible not to see how they relate to each other. Quite apart from that, I found the drawings just plain fun (when they weren’t mildly exasperating). Drawing blindly is extremely difficult but it definitely frees your mind and relinquishes your control. I don’t believe that even if you tried to have control over this activity that you could. The arty brain side takes over no matter what because you are BLIND. Especially, with music on in the background.